EXAM 70-562: I’m a Microsoft Certified Professional! So I finally took the plunge and decided to write my first Microsoft Certification Exam. With some nudges from some people to do it…and knowing inside I should have done it last year at this time…I sucked it up and went all out studying for the “Microsoft .NET Framework 3.5, ASP.NET Application Development”. This is Exam 70-562. I decided to write the 70-562 since ASP.NET is probably my most knowledgeable subject (more so than SQL Server or others). 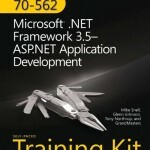 I set out and got the Exam book Training Kit from Microsoft Press (…the last copy in town…phew!). I began reading last thursday night, friday night, all day saturday and sunday. Finished the entire book Sunday evening around 6 PM… it was a somewhat loooonnnnngggg weekend. I felt confident in retaining a lot of the material (I have a bit of a photographic memory). The nights following finishing the book I reviewed chapter summaries, chapter and lesson questions, and of course the good ol’ Practice Exam Questions that come with the training kit. I booked the exam several days after finishing the book in order to motivate myself to continue studying and pushing forward. It was quite motivating and also quite nerve racking. The exam testing facilities itself had all been closed down in town…which meant a bit of travel time to get to the closest testing facility. I did the practice questions like crazy, under the assumption it would be a similar experience on the exam. My first time through them I was averaging between 70% to 80%…which of course is a fail (need at least an 80% to pass). This worried me a bit, so I amped up the studying a bit and moved that average to between 80% and 90%. Finally, I arrived to write the exam, to which they took my signature and phone. I sat down for the 3 hour test…which to my surprise ended up being only 50 questions – so I felt a little relieved knowing I could take my time on the test. However, it started out aweful…I marked the first 4 questions as needing review at the end of the test, but quickly got better a I moved on in the test. A lot of questions were tough and required quite a bit of concentration and logical thought. That being said, using the knowledge I had from studying it was a process of elimination. Usually quite easy to eliminate 2 of the 4 questions. The final two left were always quite similar and required some additional analysis. Also to my surprise in completing these questions, the experience was nothing like that simulated in the questions on the practice exams I had taken. Very much different styles, the ones on the actual test being a lot more practical based rather than theory based. This required knowing very specific things about the controls in question. I would reccomend to those taking it, to not only study this book as I did. I felt that there were some levels of detail used on the exam that were not covered in the book or used in the Practice Tests (perhaps a compilation of practice tests from different sources may have helped my expecation of the test). I got to the end of the test, made about 5-7 changes in questions marked for review, said a little prayer and hit the score button. I was surprised to find out I did much better than I thought I would / did. I ended up with a 826. You need a 700 to pass. Of course I don’t know which questions I got wrong. I assume the test is out of a score of around 900. All in all…I think thats a great score having started studying and completing the test in a weeks time span. It will definitely be easier in the future for other certifications now knowing the expectations on the exam and exactly what and how to study for them!